You haven’t heard much from my corner lately, but I assure you, I smell good! I’ve been getting settled in to our new life here in Austin, Texas, including starting a new job at BookPeople, Austin’s beloved independent bookstore (since 1970! ), which has kept me pleasantly busy with its exciting events and fun staff. As one of the lucky recipients of the By Kilian sample set, I have tested and been impressed by the entire line (mini-reviews coming soon). I also just acquired Sonoma Scent Studio‘s two latest fragrances, Fig Tree, and To Dream. I haven’t sampled To Dream on skin yet, but I’m smitten with Fig Tree, and the perfumer, Laurie Erickson, is working on a custom version for me; look here for a review of my first “bespoke” scent in the weeks to come! Another Laurie Erickson fragrance, Champagne de Bois, has come back into heavy rotation, and I remember why I fell for it so hard last year about this time. Birgit’s review on Olfactoria’s Travels inspired me to pull it out again, and I’m glad I did. It’s golden goodness is almost impossible to beat. Also recently, I tested a few indie lines that are new to me: Plume Natural perfumery, who’s Vanilla Tuberose has me re-thinking my stance on the note, and Possetts perfume, who’s weird and wonderful creations have me anxious to try more. But mostly, I’ve been wearing my favorites. Memoir Woman, Poivre 23, Champagne de Bois, Ormonde Jayne Woman, & Orris Noir. I really want to try To Dream. I think I have a lot of sample purchasing in line over the next 6 months! The novel sounds great. As far as fiction goes, I really only read sci-fi these days, so sci-fi + perfume would hit my sweet spot. Susan, To Dream smells marvelous on paper! Those Sonoma Scent Studio fragrances are so long lasting that I have to dedicate an entire day to wearing them (12+ hours), and I just haven’t been able to fit it into my schedule yet! 🙂 But that whole line is a “must sample,” as far as I’m concerned. So excited by your novel, dee! Perfume does give us the ability to time-travel so it’s a perfect plot device for a sci-fi novel. Love that little teaser and hope to read more. That Replica song is really beautiful. Very atmospheric and haunting, kind of futuristic classical. Thanks for sharing it. I was at work the other day, and an old man approached me, then stopped and inhaled deeply, telling me “your perfume takes me back fourth years!” of course, Chapmagne de Bois isn’t 40 years old, so I’d be curious to know what it might smell like. It was a really nice moment, facilitated by perfume! I’m glad that you enjoyed the songs! That album has been playing a lot in my house, but what I like about it is how familiar it feels to me–like I’ve known it for years. Android classical could be a genre, right? Oh I wonder what that perfume was! it didn’t smell like anything else to me. It’s funny I’ve done a Monday Question on compliments which will be up at the end of the month on OT. Compliments from strangers are so rare, that’s really lovely. Looking forward to reading more of your novel when you’re happy with it. You and B have such natural writing talent, I really admire it – as for me it takes WORK! So happy Austin feels like home for you. 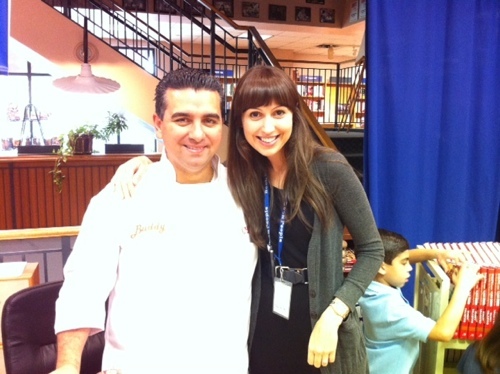 Dee, I have to tell you that you make the Cake Boss look good! Austin must be agreeing with you — you’re more beautiful than ever. Congratulations on doing NaNoWriMo. I’ve never tried it, as I’m such a slow writer, but have contemplated it some years. By the way, I bought a sample of your beloved Le Labo Poivre and am wearing it today. It really is all that!!! Love it. So happy you are loving the Kilians as much as I do. And what a great compliment to receive about Champagne de Bois! Your novel will be great! I’m a bit jealous, I have to confess, because I would love to do it too, but I just can’t fit it in… 😦 It’ll be great, can’t wait to read it! And finally – I’m so happy that Austin seems to have been the perfect choice for the two (three, sorry Cho!) of you. The Kilian’s are so great! I really like that little velvet pouch too, lol. The thing is, to keep up with my ‘noveling’ I don’t have time for blogging… and if you stopped blogging, there would be a riot! But soon little Niki will be in school, and your own novel will get under way. It will happen soon! Somehow I’m the last one to know about a new job (well, I assume since nobody else has reacted to the “news”) so belated congratulations! You look so beautiful! It’s such a cheerful picture of you! To Dream so far is my most favorite Laurie’s perfume (though there are many others that I like and I suspect that Fig Tree will be one of them after I spend more time with it). I miss your posts but I’m sure you’ll come back once everything settles. Oh, well, I didn’t make an announcement about the job— it pays about a third of my previous one, so unless I get a major promotion, it probably won’t serve as a long-term career option 😦 Which is too bad, because I really like the place! I miss blogging! But I think that if I come out of November with a rough draft of a novel, it will have been worth it. Hey, maybe I’ll even get published one day, and be able to write as my only job! Now that would be tops!! Congrats on the new job – sounds like you’re enjoying it. It was your talking about it last year that piqued my interest (about NaNo), and “hearing” you prepare for it this time around that inspired me to give it a shot—why not, right?? Eeeeee! I let out a little cheer when I saw that you had posted. You have been missed. I’m so glad to hear Austin is working out, and to hear about how you’ve been staying busy on the perfume and the novel and the perfume-related novel front! I just received some Plume Perfumes last week and am really enjoying them. Thanks for sharing the photo, too. You’re very pretty! Welcome to Austin! There’s a few of us ‘fume nerds here. We should meet up some time. Yay! Maybe after the holidays. I’ll message you, or maybe run into you at BookPeople! Hey Dee!- I have been loving Champagne de Bois too and might need a bottle of it soon. I think I enjoy wearing it a leetle bit more than Bois des Iles- it is chewier and the sandalwood is more satisfying (atleast compared to the version of BdI that I have from the split). And soo exciting about the novel. I love the concept! I started one a while back involving smell memories and smell triggered experiences. It has stopped progressing because of work- I am really tempted to do nanowrimo sometime- but November is always ‘conference month’ unfortunately. Hopefully in a couple of months, I’ll be able to write more. Can’t wait to read excerpts of yours- I love the sound of it. “chewier” is a perfect way to describe it! I love me some Bois des Iles, but I too seem to prefer CdB.